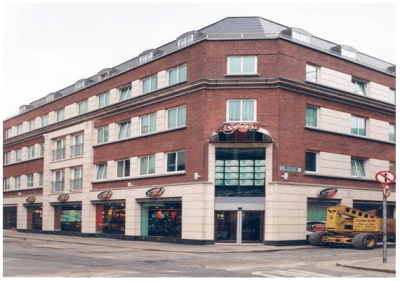 Morgan Hotel & All Sports Café – Duggan Brothers Ltd.
Peter A. Curtain & Co. This project consisted of the construction of a thirty-bedroom hotel and a theme restaurant, which involved 50% refurbishment of an existing building and 50% new building. The new building element contained a basement founded on in-situ concrete piles. Soils and wastes from the building were taken to a pump sump, which had to be constructed partially below the water table level in the existing basement, and then pumped to Dublin city Council’s main sewer on Fleet Street. The project also included kitchen and restaurant fit out. The project was completed on time within a six-month time frame.